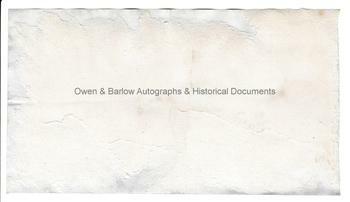 SIR EDWARD SABINE Royal Society Subscription Receipt Signed. Irish geophysicist, astronomer, ornithologist and explorer. President of the Royal Society. 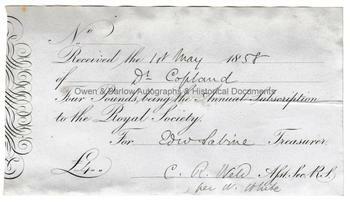 Receipt for Four Pounds paid by Dr Copland, being the annual subscription for membership of the Royal Society. 1st May 1858. signed by Edward Sabine as treasurer of the Society and also by the assistant secretary C.R. Weld. 18 x 10 cms (7 x 4 inches). Slight discolouration. Remains of old album leaf adhering to verso. All else very good. Edward Sabine took part in the Ross Expedition to the Arctic in 1818 and the quest for the Northwest Passage when, amongst other research, he carried out experiments relating to the effect of magnetic north and the behaviour of pendulums in high latitudes. He later developed this work and made a number of important discoveries and established magnetic observatories in many parts of the world. He also did work in the fields of volcanology, ocean temperatures and barometric pressure. Sabine took part in the now famous 'Longditude' boards of the Admiralty and afterwards became advisor to the Admiralty with Michael Faraday and Thomas Young. He was a noted ornithologist and Sabine's Gull is named after him. He became the 30th President of the Royal Society in 1861. "Dr Copland" is James Copland F.R.S. (1791-1870), the noted Scottish physician and writer on medicine, from whose family album this receipt is taken.